This book is a compilation or anthology of the some of the best and most current research on Chiasmus in the Church. Each of these author/presenters includes a powerful and unique perspective comprising the separate chapters of the book. Chiasmus, once assumed to be only an ancient Hebraic literary pattern, has now been shown to be a pattern in all things. It has been identified in both the sciences and the arts. Chapters in this compilation are based on presentations at a recent conference organized by Yvonne Bent on chiasmus. The authors/presenters show how this pattern can be recognized in art, music, architecture, mathematics, the human body and even the atom. Chapter summaries: Denver Snuffer introduces the concept of chiasmus and provides broad context for understanding its impact. 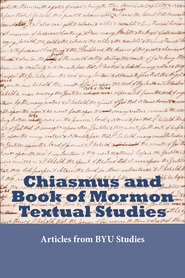 Greg Carlston summarizes how to discover chiasmus in the writings of the prophets, and diagrams chiasmus across the entire Book of Mormon. Scott L. Vanatter and (posthumously) Jared R. Demke outline a repeated, thematic pattern (Davidic Chiasmus and Parallelisms) in LDS scriptures and proclamations, in Joseph Smith’s expansive King Follett Discourse, in early Gnostic literature, in the Declaration of Independence, in the Gettysburg Address, and in Martin Luther King, Junior’s seminal I Have a Dream. Mark A. Shields discusses chiastic patterns in the plan of salvation with special emphasis on the Garden of Even and the Tree of Life, etc. Lenet Hadley Read presents an extensive review of the overarching chiasm of Christ as Bridegroom. Yvonne Bent summarizes chiasmus and the Covenant in the human body, discussing, e.g., the brain, DNA, and light. Kathryn Paulsen, (written by Yvonne Bent) discusses how chiasmus relates to atom and elements of the periodic table. Val Brinkerhoff discusses and shows images of many chiasmus examples in sacred architecture, with scores of photographs and illustrations. Individually and collectively, the authors present how understanding chiasmus leads us to Christ. As all things testify of Christ, recognizing and understanding this pattern in this way adds depth and breadth to that testimony. May your journey be a wonderful adventure. May you discover the beauty of newly discovered and newly considered patterns as you ride the high seas of discovery. This Second Edition has added a Bio on each author, an Index, and improved the formatting for ease of reading. Love the contribution made By Denver Snuffer. His insight is clear and inspired. His shared understandings help lead us to Christ. The clarity and spirit with which his observations are made does indeed enlarge our hearts and minds to the will of the Lord. Rather than passing over chiasmus as a mere literary tool, Snuffer enlarges our vision to receive instructions from the Lord and assists us in appreciating the power and depth of love that comes from our Father. What an amazing book. Opens a wealth of knowledge behind the power of the BOM and to understanding it. I was not even sure who all the authors were which is rare when buying books at DB. Is Denver Snuffer an authority of some kind? His introductions and explanations opened up my understanding like never before, very powerful stuff. I bet he was a great mission president or area authority at one point... Pick this book up today, definitely worth investing your time to learn the mysteries of God. I was honored to be asked by Yvonne Bent to participate as one of the presenters at the original conference which inspired this book. Doubly so to be an author of one of its chapters. The other authors provide readers with a breath and depth of insight which is unique among the extant works on chiasmus. Their insights and commentaries are both exciting and enlightening. Even though I have a built-in favorable bias towards the subject, the book, and its authors, I do highly recommend this survey of how chiasmus can be seen not just in literature, but in life and the world around and within us.